Last month I was lucky enough to nab one of the coveted tickets to the How To Get Into Beauty event at Marie Claire's London HQ. In association with Estee Lauder, the event was essentially an intereractive seminar featuring Marie Claire's Beauty and Style Director Lisa Oxenham, Estee Lauder's Communications Manager Anna Rozelaar and Global Makeup Artist for Estee Lauder, Alan Pan. The event was interesting, informative and above all, lots of fun as Lisa and Anna gave guests invaluable insider advice and Alan did a fantastic makeup masterclass using Estee Lauder products. After being inspired beyond belief by these fabulous people, we were reminded of the goodie bags waiting patiently under our seats (as if we'd forgotten) and it took all my strength not to peek inside until I was out of the building, up the road and on the underground. As well as the October issue of Marie Claire, we also received some fantastic deluxe samples of Estee Lauder skincare and makeup. All the samples were gorgeous, but the two I was chomping at the bit to try were the Serum and Eye Cream from the Advance Night Repair range. 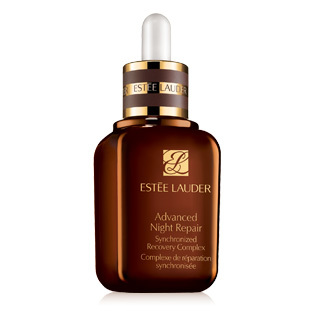 The Advanced Night repair Synchronized Recovery Complex serum is an award winning formula that claims to do all kinds of fantastic things to the skin but above all, endeavours to improve the appearance of the signs of aging. I've been using these two since I received them at the event and I can honestly say that the texture of my skin has definitely improved. To apply the serum, I pour a small amount onto the back of my left hand, then apply it with the fingers on my right. The funny thing is, the back of my left hand has become a lot softer, I'm guessing as a result of having the serum on it every night. Surely that's a good sign! The eye treatment has a very slight chemically smell that I found a bit scary at first, but it is a pleasure to apply thanks to the silky, gel like texture of the product. I love these EL products, esp the serum.